In a more perfect world (where there are fewer crippling complications) Stuart Cooke’s multi layered and lyrical verse translation of a Traditional Song Cycle would probably be what most of us would like First Nations literature to look like. It is a richly collaborative project bringing together the creative energies of Traditional Owners and a non-Indigenous academic and poet. Cooke’s book is a proud celebration of Nyigina Culture and Language and makes an invaluable contribution to Cultural maintenance. 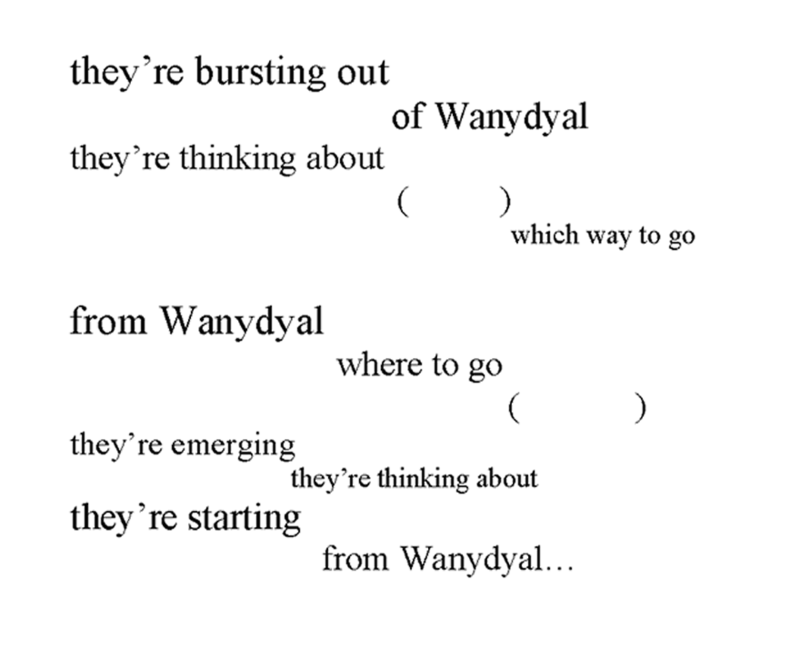 In publishing his “song-poem as a verse-in-translation” Cooke runs concurrently on each page four versions of the song-poem: firstly there are extracts from the story in Nyigina language; then there are a number of short mediations on the story through the voices of Butcher Joe, Roe or Dyungayan; this is followed by the translation of the anthropologist and linguist Ray Keogh; before finally we are given Cooke’s more contemporary poetic translation. This presentation of the four versions of the song-poem works together seamlessly in what is a stunning collaborative performance. This unrestricted song cycle from the Bulu Line is a collection of 17 songs and was received by George Dyungayan in a dream from his father (the late Bulu) before being passed onto Paddy Roe and then onto Phillip Roe (a Goolarabooloo elder). We are fortunate that the custodians of this story have chosen to open it to the world via the conduits of Ray Keogh and Stuart Cooke. The story begins with the spirits of George Dyungayan and his father, Bulu, emerging from Wanydyal (a waterhole). They then travel in a loop, dancing and singing across country, as they encounter various animals and spirits (including a rainbow serpent’s ferocious storm as payback) – this is a remarkably magnetic narrative powerfully and respectfully rendered by Keogh and Cooke. George Dyungayan’s Bulu Line is certainly a charismatic model for the “song-poem as a verse-in-translation”. Lionel Fogarty’s Eelahroo (Long Ago) Nyah (Looking) Mobo-Mobo (Future), on the other hand, is an unflinchingly uncomfortable read interrogating colonialism’s crooked paths with devastating impact. Fogarty combatively stakes his voice somewhere between Aboriginal English and Standard Australian English as he confronts the social and political realities of contemporary dispossession, racism and victimisation and the painfully recalcitrant attempts by the non-Indigenous Australian hegemony to address Indigenous injustice and disadvantage. At times his uncompromising voice of indignation and anger verges on that of a rant but the energy and forcefulness of his poetic is, to me, irresistible. Our battle just as your sunrise and night sigh ties. The noble note runs in our native modern now from then. Remember the black nights turned white no lights just colour remembers. Remember 200 thousand dreams and the minds balance houses. Earth in focus world words around.